The zombie was already in bed when I walked into the dorm at 10pm after dinner, and by 7 am the following morning he was still sleeping and it was still raining. By the time I came back from breakfast he had disappeared, though, but unfortunately the same could not be said about the rain. 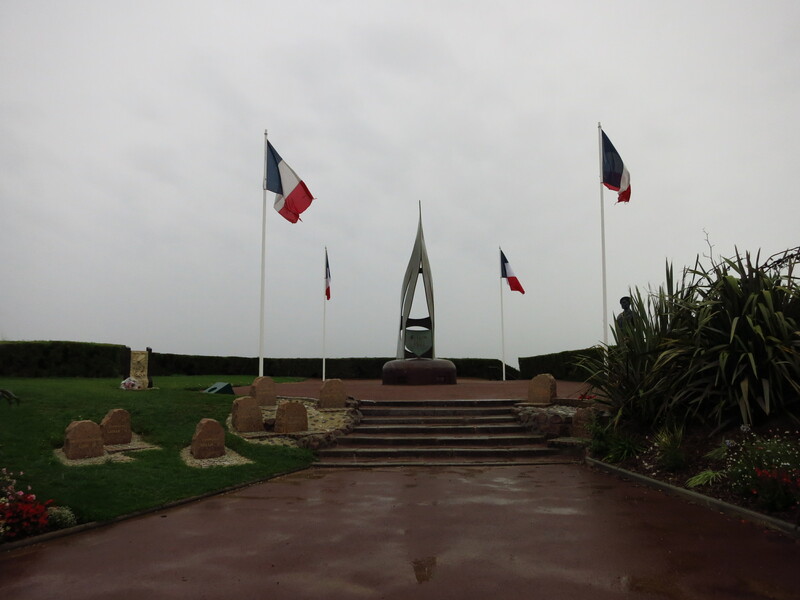 If it did not stop soon, visiting all the D-day beaches was going to be tough… But up here there are two kinds of weather: rain and heavy rain, so I decided to set off anyway. Heading out of Caen on the D514 the weather was only rainy, and in a few minutes I reached the first stop of the day – Sword beach. 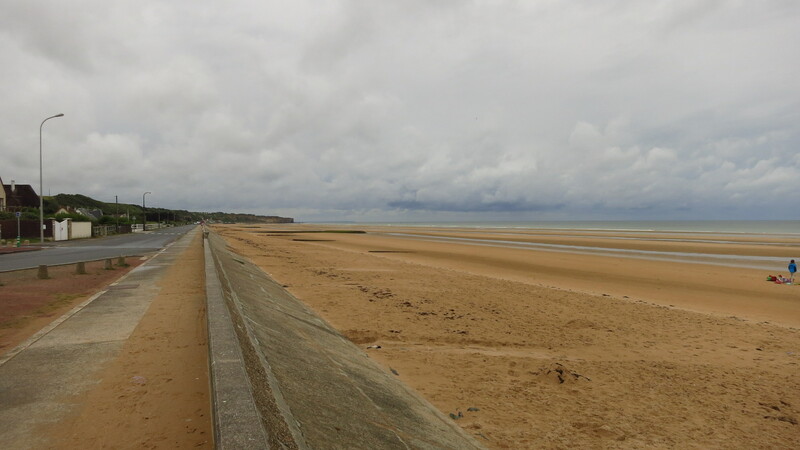 This was the easternmost of the five beaches where the allied army landed, the closest to Caen. It was a bit of a disappointment, though. There is not much left of the landing there, most buildings and bunkers were heavily bombed and are gone today. 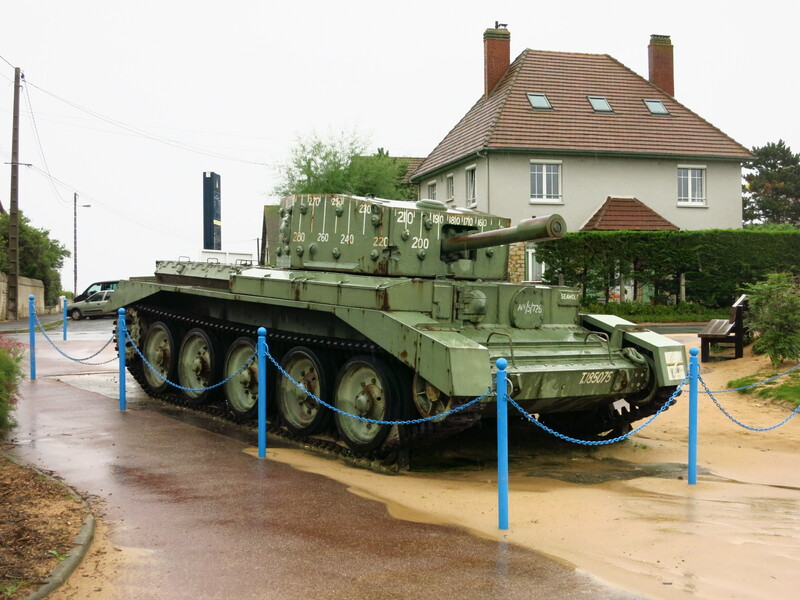 I parked at the Sword Beach Landing Museum, but it did not open until 40 minutes later. 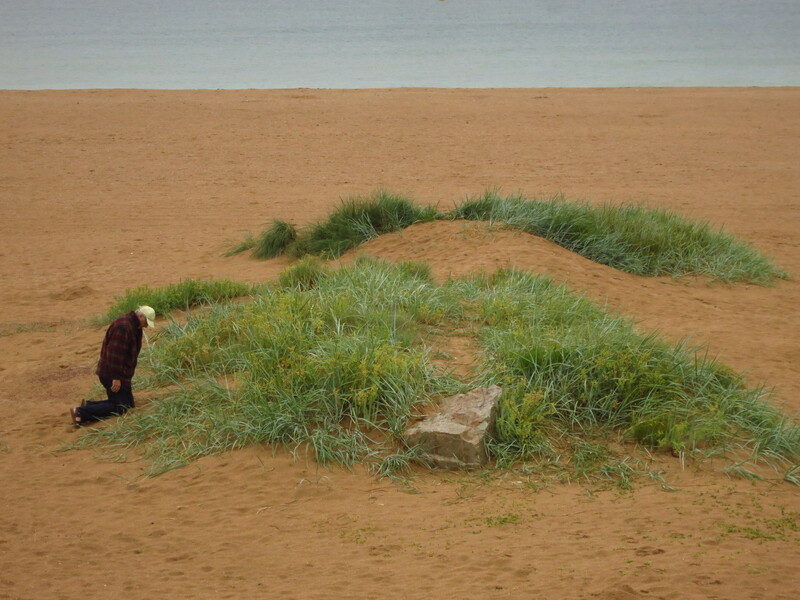 The weather had changed to heavy rain and I did not want to wait out there, so I went on along the beach and stopped each time I found something to visit – first a memorial on a small mound from which I could take in the size of the beach. It was long, wide and flat, unlike the beaches leading up to rocky cliffs that are usually depicted in films. The landings here were successful and with very little casualties, the advance of the allied troops only meeting resistance once they started to move inland. I also found a British Mk VII Cavalier tank by the side of the road and a bit further a piece of artillery that, curiously, pointed inland, or at least it seemed to. 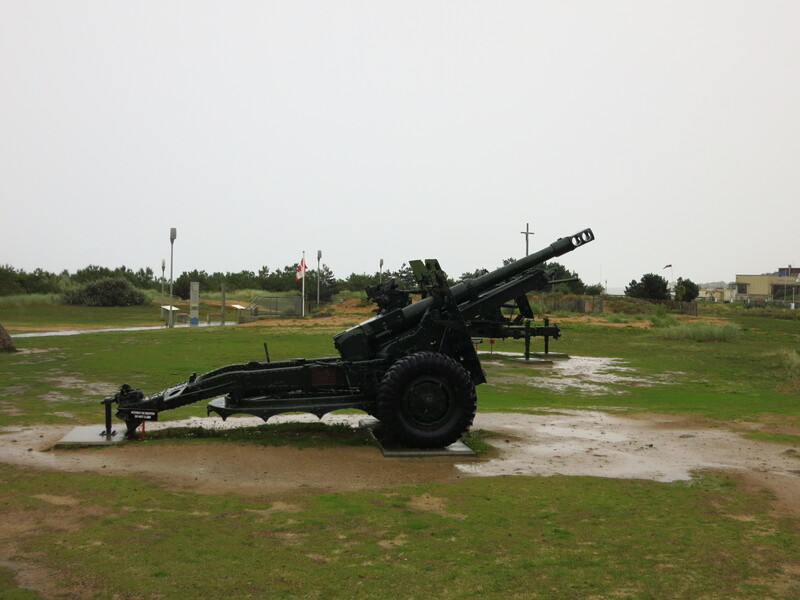 It was an anti-tank gun built that way to protect it from attack from the sea, and it could turn more than 180º to cover the beach in both directions. Next stop was Courseulles-sur-Mer, at Juno beach. This beach was assigned to Canadians and the British, which is why there is a Canadian museum of the landings. Now, you might think that museums sound like a good thing to visit if it is raining outside, and you would be right, but that is if you travel by car. On the bike, keeping yourself dry is a process that involves several layers and they take time to put on and take off. Leaving them on means dripping water all over the museum and suffocating in the gear that keeps you warm on the road, taking them means either a strip tease show in the car park or taking the time to find a private place to do so, and it is laborious. Fine to do once, like for lunchtime, no so much when you stop to visit something every ten minutes, and because it keeps you dry, you might as well visit things outdoors. With that reasoning, and with the weather in very heavy rain mode, I visited the beach and the remains of some bunkers near the museum with even the helmet on. There was nobody else out there, luckily, as I looked like some kind of weird astronaut exploring a rainy planet Mars. 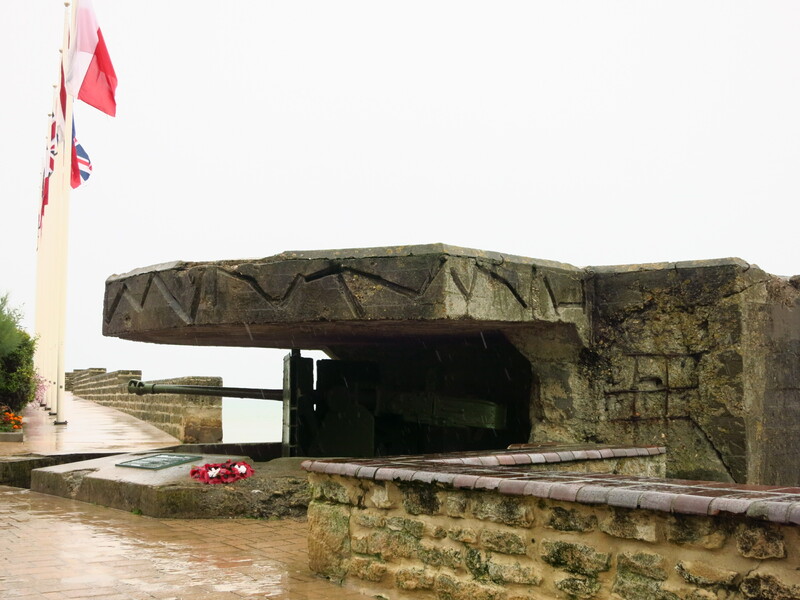 I was looking forward to the next stop – Arromanches. It was the site of Gold beach, where one of the most astounding feats of engineering in the war took place. The Mulberry Harbour. 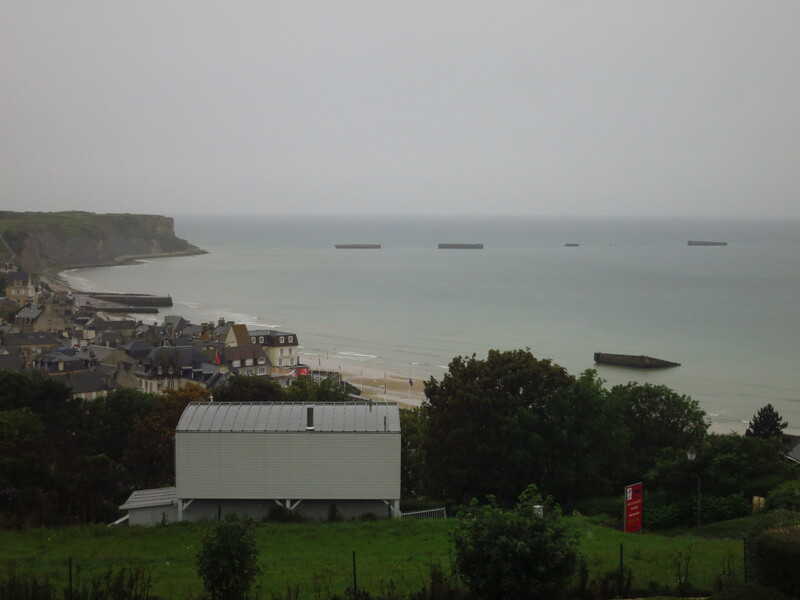 The town is on a beach between two cliffs, and overlooking it there is the Arromanches 360ºCinema. Its car park offers a perfect viewpoint from which to see what is left of the structures that formed the harbour. The tide was high, so I could not see much. Some of the enormous concrete breakwaters that had been laid in a semi-circle to protect the harbour from the waves were still in place, as were a few concrete structures near the beach, but that was it. Then I turned away from the beach to go to Bayeux, first city to be taken the day after the landings, and site of the largest of 16 Commonwealth cemeteries in Normandy. It was pouring down and the cemetery was far from the car park, so I did not visit it. After that, the weather seemed to have decided to give me a break for the most impressive sight of the day – Omaha beach. The road at this point does not go right along the beach, for we are in the area where the infamous cliffs depicted in countless movies are, but there are numerous signs on the main road that point to different lanes leading down to the it. I turned off at the first one in Colleville-sur-Mer and rode down to find the section of the beach where the 1st Infantry Division, the Big Red One, had landed. Omaha was assigned to the Americans, and they knew it was the hardest of the five beaches to take. It was heavily defended, surrounded by cliffs, and to the west there were the Pointe du Hoc fortifications, which could lay their fire over the beach. These men, together with the 29th Infantry Division in the western section of the beach, were the first wave of the attack on Omaha. After a crossing in very rough seas that flooded the landing craft and sank 10 of them, they reached the beach and found it unexpectedly well defended. Fire from small arms, machine guns, mortars and artillery rained down on them from the high ground held by the Germans. A lot of them did not even reach the beach, their craft dropped them on sand banks and they had to cross almost 200 metres of sand and water, laden with weapons and equipment. Those who landed on either end of the beach got the worst part, being closer to the defences on the cliffs. The bombs dropped by the allied planes in the hours prior to the landing had fallen too far inland, leaving most of the German defences intact. Right in the heels of the first wave of attack came the engineer corps to clear paths through the obstacles so that more infantry and artillery troops could land, but due to the chaos and the bad weather most of them did not land at their intended locations and had to do their job with little to no protection from infantry. All in all, there were about 3,000 allied casualties that day. 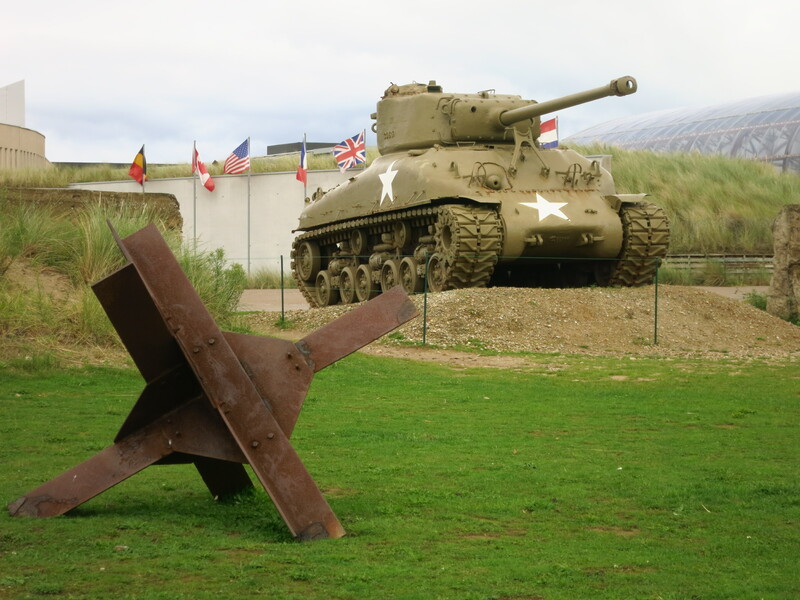 There is a memorial to the 1st Infantry Division here, at the site of the German strong point WN62, the most important of 15 strong points defending Omaha beach. Only part of it remains today, but seeing the size of the place and the armament it had, one cannot but marvel at the bravery of the men who took this site. 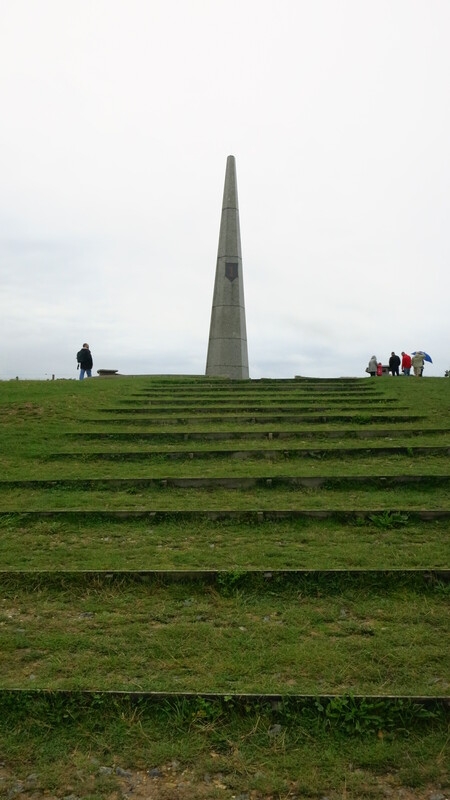 Up on the bluffs that overlook the beach and that were so hard to take, there is the Normandy American Cemetery. 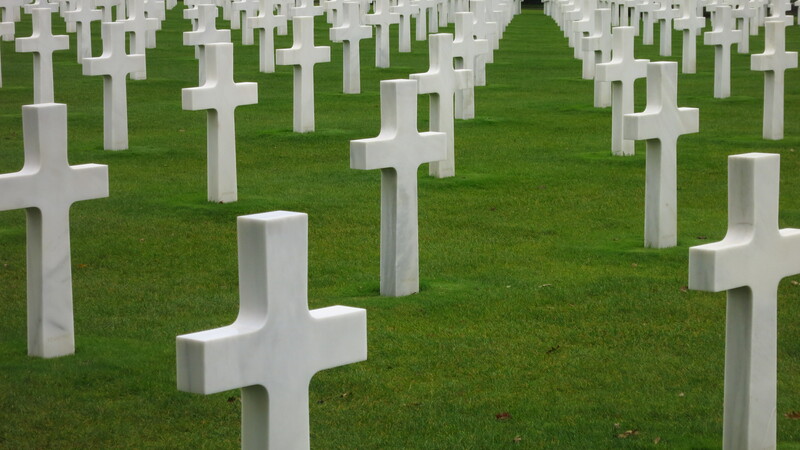 Row after row of the white crosses mark the graves of 9,387 men who lost their lives here. 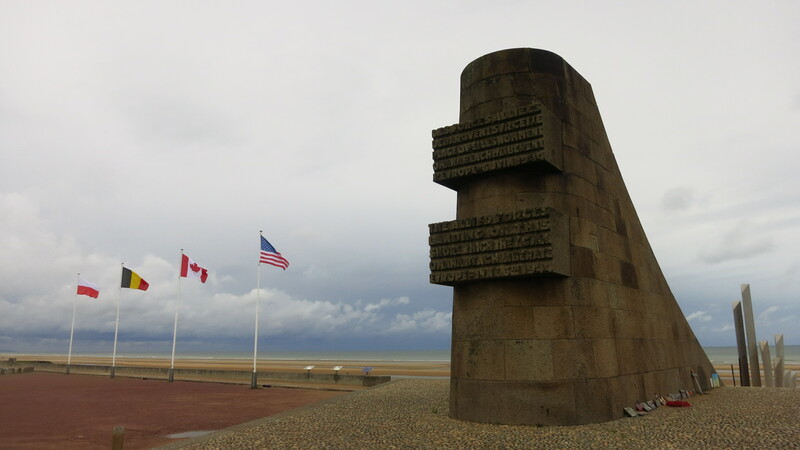 The rain finally stopped for good when I was at the Omaha Beach D-day Monument at Saint-Laurent-sur-Mer, which gave me some time to visit the monument and walk along the beach. At this poin it is wide at low tide and there are no cliffs, but there are still some hills and only one way out of it, through a valley that becomes narrower as it heads inland. In addition, those who landed here were exposed to the artillery fire coming from the next site I was going to visit, and the scene of one of the bloodiest battles of the day – Pointe du Hoc. Point du Hoc is a promontory between Omaha beach, to the east, and Utah beach to the west. With a 30-metre cliff, it is the highest point between the beaches, and being such a critical position, the Germans had fortified it as part of the Atlantic Wall. It posed a great threat to the allies operation, so a special plan was devised to take it. 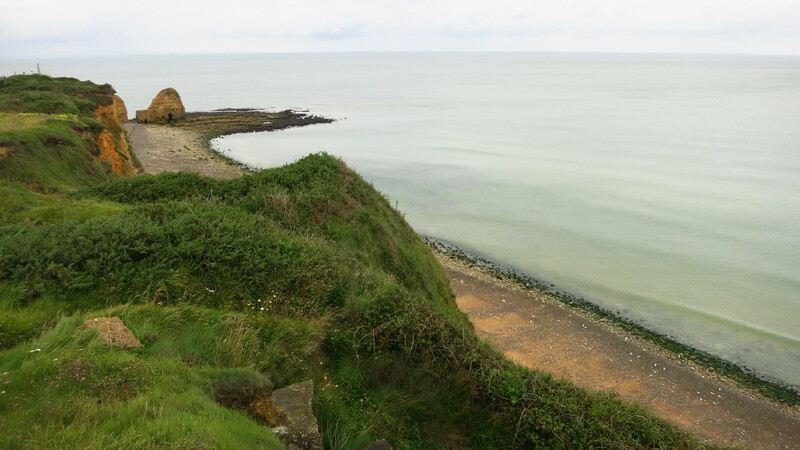 Three companies of Rangers would land at the foot of the cliff before the main landings and climb it using ropes and ladders to fight the Germans at the top and gain control of the area. As with other landings that day, the bad weather badly decimated the 12 landing craft and four amphibious trucks heading for the attack – two boats and two trucks sank. The troops had rocket launchers with which to fire hooks onto the wall of the cliff and attach climbing ropes, but the ropes had been soaked during the crossing and were heavy to reach the wall. In addition, the 30-metre ladders they carried turned out to be too short to reach the top of the cliff. 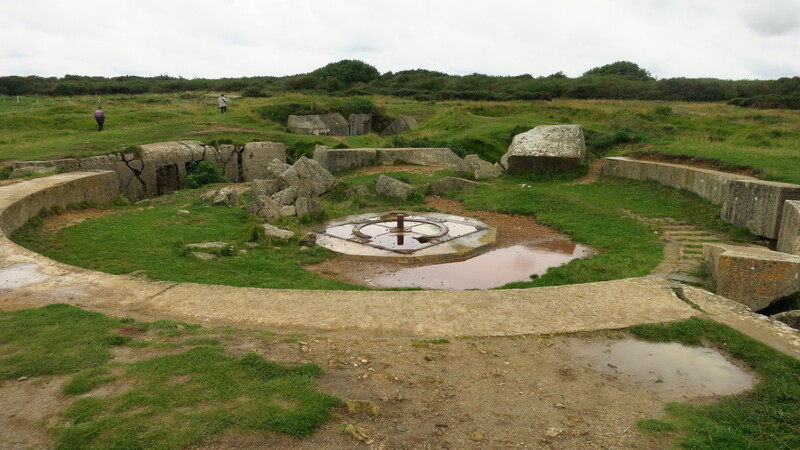 The plan was for the Rangers to signal for reinforcements once they had reached the German positions at the top. If the signal did not come, the eight Ranger companies that were supposed to help them were to turn to the beach and help the landing there. Because they took so long to climb the cliffs, by the time the signal was sent the rest of Rangers were already on the beach, thinking they had failed, which meant they were left on their own to take the guns positions and clear the ground inland. 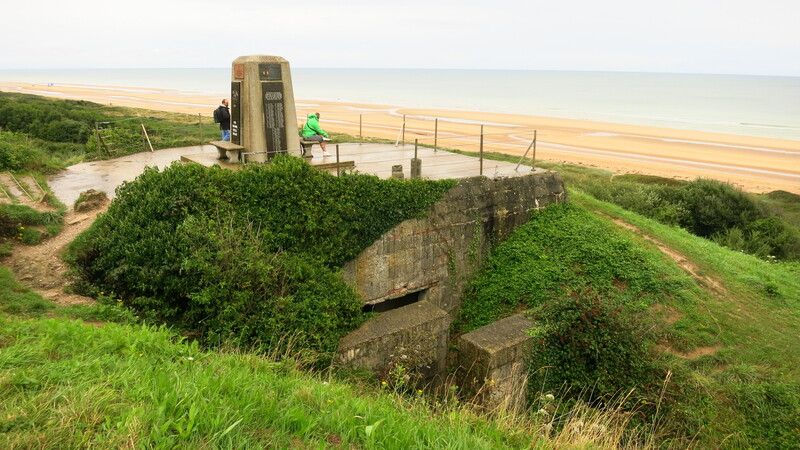 When they reached the fortifications they found that the guns had been removed to protect them from allied bombings, it turned out that the artillery fire raining down on the beaches was coming from the Maisy battery, further west. Two patrols found the guns some distance inland, camouflaged in the bushes and ready to fire, and destroyed them. But despite having taken the fortification, the worst was still to come. Of more than 225 men in the attack, only 90 were left able to combat effectively. Without reinforcements nor radio communication, they had to fight against constant German counter-attacks trying to regain such a critical position. Only after two days of fighting in terrible conditions were they relieved when tanks and infantry finally linked with them from the beach. Although partially destroyed, most of those fortifications are still at Point du Hoc today. It is a maze of bunkers, casemates and gun pits. 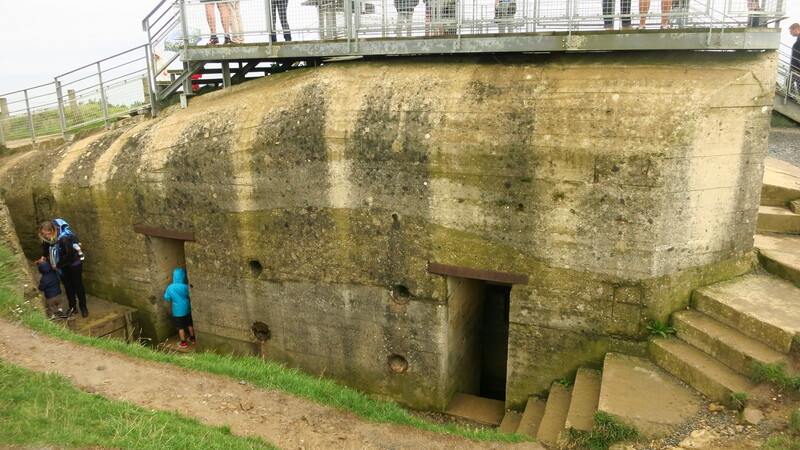 It originally consisted of six 155 mm French guns from WWI in open pits, but realising the importance of the position in the case of an attack by sea, the Germans had set out to build six casemates. They used French forced labour, who worked as slowly as possible to try and sabotage the construction, and at the time of the landings, two were still unfinished. That, and the fact that the guns had been withdrawn inland to protect them from air raids, prevented the landings at Omaha and Utah beach from being even more deadly. With the rain gone but the skies still grey, I reached the last of the five beaches – Utah beach. 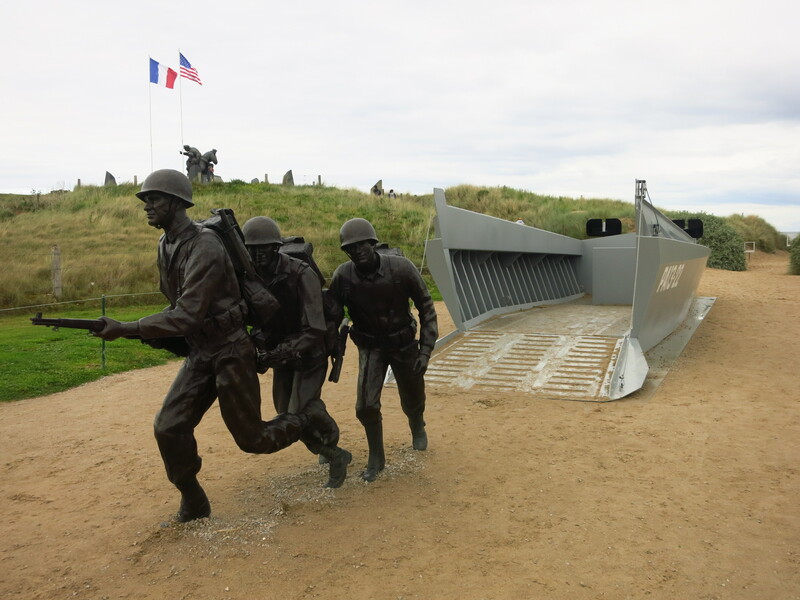 There was a memorial, a museum, a Sherman tank and a replica of one of the landing crafts used in D-day. It was late, my boots and gloves were soaked after almost 9 hours in the rain, and I still had some way to go to get to the hostel in Cherbourg, so I did not visit much there. The weather forecast for the following day was good, so I decided I would ride back to Caen following the same route in reverse and visit everything I had not been able to visit today. Just as in the successful French comedy Bienvenue Chez Les Ch’tis, the old cliché about the north and the rain proved to be true one more time. On the way to Cherbourg and the Cap de la Hague I wanted to stop at Mont Saint-Michel. I expected it to be full of tourists this time of year and I did not have much time, but it did not matter, I had already visited it when I was in Brittany years ago and I just wanted to drive by and see how it looked today. As I approached the region under the sun, I saw the sky was cloudy ahead of me, as if the line of clouds indicated the border of Normandy. 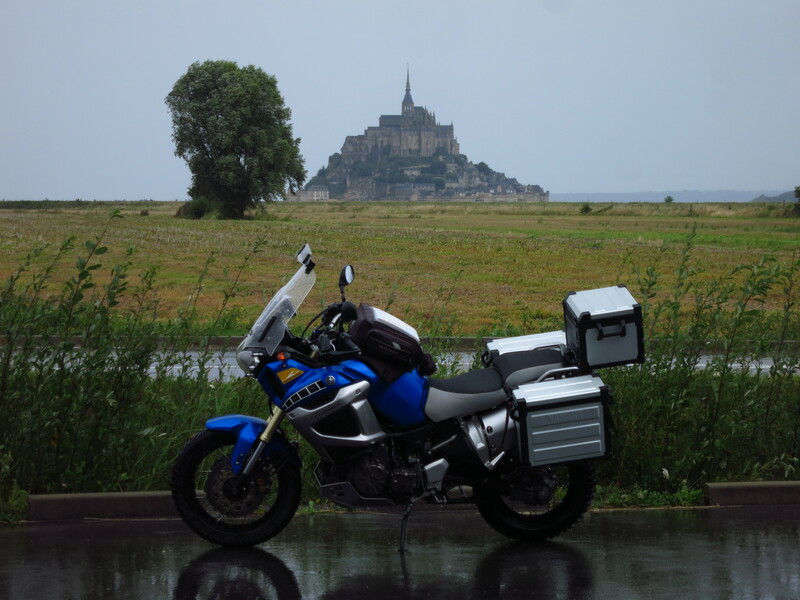 The thought of stopping and putting on the waterproof crossed my mind, but I told myself that it did not look that bad and I could likely reach Mont Saint-Michel before it started to rain, since I wanted to stop there for lunch anyway. A few kilometres before the town of La Grève, a few drops started to fall and I stopped at a picnic area to put the extra layers on. I spent ten minutes fighting with clips, zippers and a very strong wind and by the time I was done the rain had stopped. Well, at least I would be warm now, the wind was freezing on the motorway, but I still think that this kind of setup requires a lot of forward thinking, I would have got soaking wet if the rain had started suddenly. Since I was there and it was not raining, I had some lunch and went on my way. Mont Saint-Michel was the same I remembered it, but with a lot more tourism, which meant that new car parks had been built closer to the town, and it was not possible any more to drive near it. Obviously, all of them were paying car parks, so I just drove a bit further down the road to the east to see the Mont and take some pictures, by which time it was raining harder. I got on the bike before the rain got worse with the intention of heading to Cherbourg fast, but I got distracted by a sign by the side of the road that pointed to a German military cemetery. I had no idea that the side who lost the war had such things in France, and least of all here, so close to the coast where D-Day took place, so curiosity got the best of me. 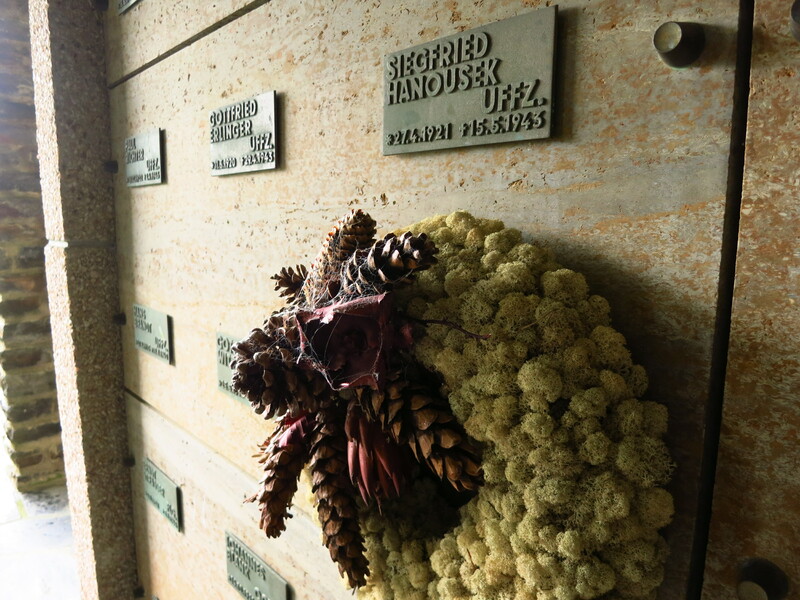 It turned out that it was not a cemetery, but a mausoleum, and a big one. 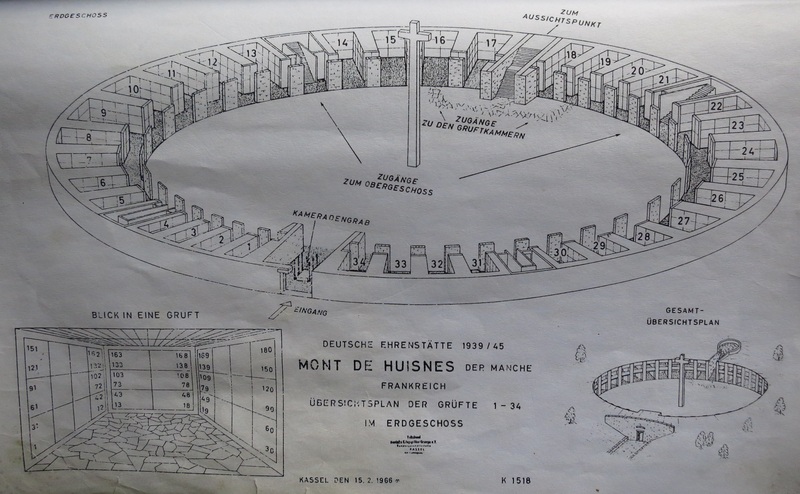 It is called Le Mont de Huisines-sur-mer, and is a circular building of almost 50 metres in diameter with 34 crypts in two levels that open to a central lawn. There lay the remains of 11,956 German soldiers. 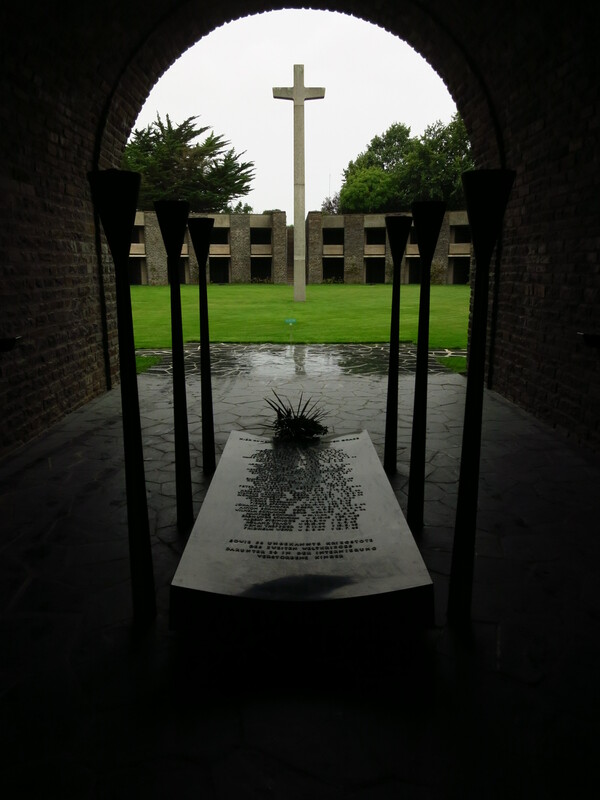 The allied invasion and the battles that followed left very heavy casualties in the German army in this region, and in 1954, only ten years after the landings, the French and the Germans signed an agreement to take care of several cemeteries in the region. This mausoleum was built by the Volksbund Deutsche Kriegsgräberfürsorge (the German Popular Association for the Maintenance of Military Tombs) with important funds from the German government. 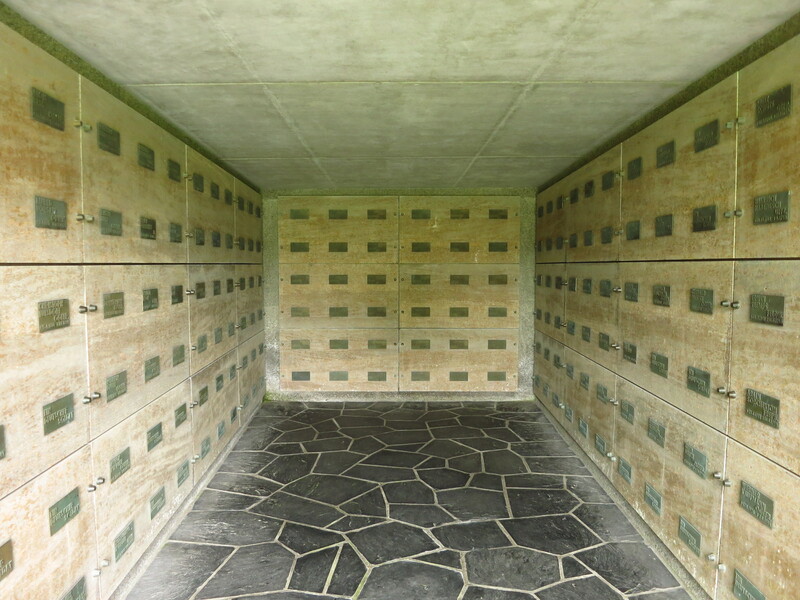 In 1961, the transfer of the bodies from cemeteries in Morbihan, Ille-et-Vilaine, Mayenne, Sarthe, Loire-et-cher, Indre-et-Loire, Viene and Indre started, and the mausoleum opened in September 1963. As I walked through the gates into the circular lawn the rain intensified. 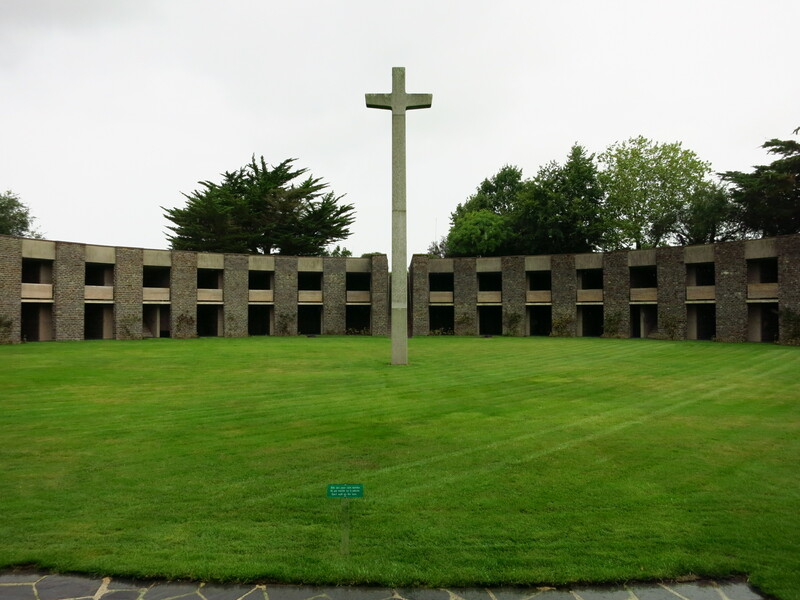 The circle that the crypts form is underground, but while the mausoleum is not visible from the distance, the cross that stands in the middle is, it can be seen from Mont Saint-Michel. It is difficult to describe what I felt walking from one crypt to another completely alone, the echo of my footsteps and the rain hitting the ground the only sounds that filled the void of the vast space. History is written by the victors, usually in black and white, and the entertainment industry takes good care of turning it even more black and white. It is easier to see the world with clearly defined borders around good and evil, and in the case of WWII the defeated side were so evidently evil that it is difficult to think otherwise. But who were really these people whose names lined these walls by the hundreds? Most of them had been born in the early 20s, they were young men, not commanding officers, who lost their lives fighting for a country, just like any other soldiers. They just happened to have been born in the country with the wrong leader. I am not going go into the argument of how much the regular non-SS German soldier or citizen knew, if any, about the atrocities that their leaders were committing, I am not an expert on the subject, so I had better leave the debate to those who are better informed than I am, but looking at those graves, I felt horrified at how random it is. You are born in a country. That defines your nationality, your language, your way of thinking and should it go to war, which side you are going to lose your life fighting for. Sure, there are people who see further, people who ask questions, both to themselves and to others, who see the world through different eyes and question it, but most people are just followers. These people here did what most people would do if their country went to war. And they probably did not have much idea what was happening. And they died. They just happened to have been born in the wrong place at the wrong time. After the visit the day was grim as my thoughts. The rain did not let go, it only got worse and the suit was starting to soak up water – it would not be long until it seeped through. It was starting to become clear that I was not going to make it to Cherbourg (150 km to go) so I turned towards Caen in search of the Youth Hostel there. When I stopped for fuel I thought I would take the chance to reprogram the GPS since I was sheltered from the rain at the pumps, but up here it rains sideways, so even under the petrol station roof I could feel the rain pelting against my helmet. I got on the bike again, used the good old method of following road signs and made it to the hostel. 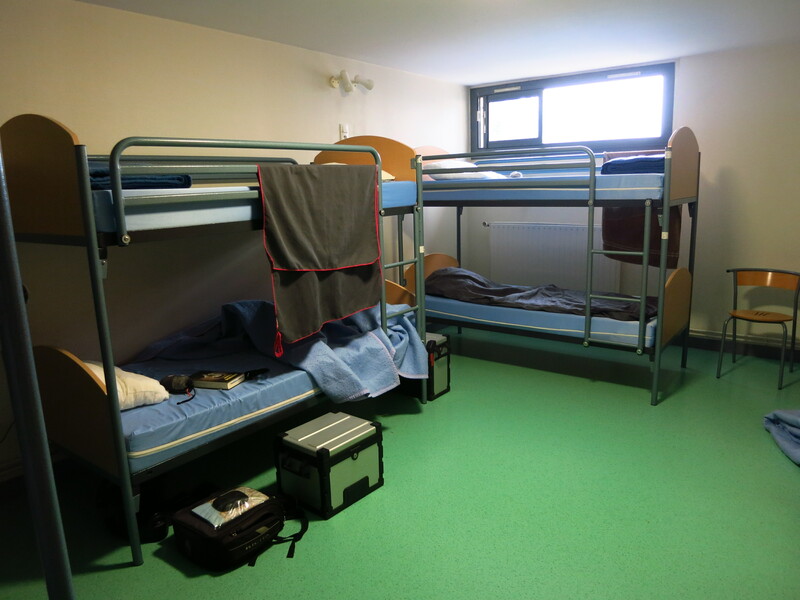 On the positive side, the hostel only cost 13€. On the negative, it was for a bed in a dorm, and when I walked in I found the usual zombie that one sometimes finds in these places, a young guy sleeping on his bunk even though it was only 4pm. He was still sleeping by the time I had unloaded the bike, had a shower, calculated the expenses of the day, planned the route for tomorrow and sat down to write these lines. Only by dinnertime had he risen and the bunk was empty. It looks as if it was only the two of us in the dorm… I prayed he would not snore.